But what I am sure of is that God has a purpose and a plan for whatever he’s got us going through right now as a group of wannabe followers, both the churchies and the “not-churchies” (does anyone have a name for them yet because we need to name every group of people? Sarcasm intended). I don’t think he’s out to destroy the church as we know it; it’s part of his body too. For some of you the church is the wise old uncle in your family who has taught you so much and you’d trust with anything. For some of you the church is that annoying cousin who you visit once in a while that always needs money. But family is family, even if you don’t like it. Why don’t we just get over it and realize we’re all in this together, no matter what it looks like. 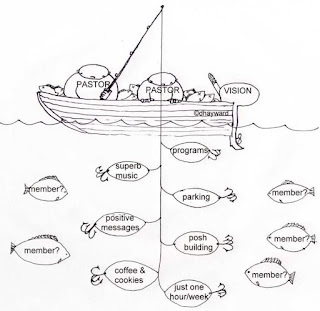 Our purpose isn’t to do church, or not do church, Jesus said I will make you fisher’s of men. The disciples were no different than us, they argued about how it was going to go down while Jesus was in the same room. Then they argued a bunch more after he went home. I think it’s because he never really taught them how they were supposed to do it. He didn’t give them a study guide, he didn’t give them a fish finder, most of the time he didn’t even give them a reason. He just said things like go out and let your nets down, yeah I know you’ve been fishing all day and caught nothing, just do it. Oh look, fish, imagine that… What He taught them was to depend on what he said to them. He taught them that he’d never let them down. Then he taught them that he’d send his Spirit to continue that after he went back home. I went fishing today (real fishing for fish, not men) with my friend Rick, one of the people I’m walking very closely through this Jesus-following adventure with. We went to a place where I’ve had great fishing so far this year. We left at 5:00 am to get on the water at dawn, the best time to catch fish. The conditions were perfect; still water, bugs on the water, fish jumping out of the water… 3 hours later, nothing. Guess what, it wasn’t about the fish. I thought it was when I left, last time I caught the biggest brown trout I’ve ever caught there. This time nothing. It wasn’t about the bait, I tried every fly and lure I could think of, even a juicy worm didn’t work, nothing. It wasn’t about the conditions, they were perfect. For some reason there were no fish today. But Rick and I had great conversation about, God, life, family, church, fishing, work, not-church, a beaver, rock climbing, our kids… then we paddled of separately and spent time talking to God, then we went home with no fish. Strangely, we didn’t spend the drive home talking and lamenting about why we didn’t catch any fish, in fact, the thought never crossed my mind. Instead we just talked more about that other life stuff. Neither of us is much closer to figuring out what we’re doing, or what we’re doing wrong and I’m not sure about him but I am much closer to feeling like I don’t care about that. What if we do figure it all out, how do to church or not-church? The disciples hadn’t suddenly figured out how to catch fish when they went back out to let their nets down, they’d just figured out they have to listen to Jesus, he makes the fish come. They just have to pull in the nets. If Jesus said go throw your nets in a mud puddle they still would have caught fish, if he said go put your nets in the bath tub, they would have caught fish. I think it’s the same for us. 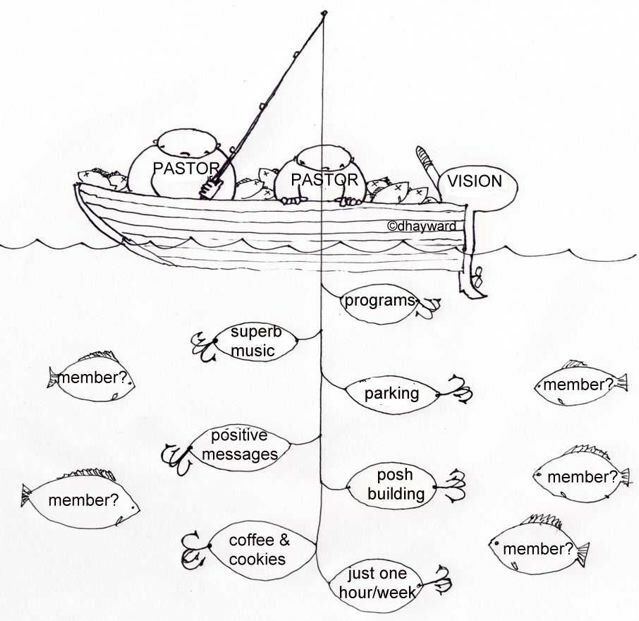 If he tells us to have a church service because he wants a church service, we can be fishers of men, if he tells us to do house churches and we do it, we’ll be fishers of men, if he tells us to open a youth center, we’ll be fishers of men, if he tells us to fly in Francis Chan, Billy Graham and Bono, we will be fishers of men – but only if he tells us to do that and only if we listen when he tells us. If we do any of it on our own – no fish. If we do any of it because it worked for someone else – no fish. I keep praying and racking my brain to figure out how God wants me to help “lead” these youth, how he wants me to help “lead” this church, how he wants me to help “lead” this movement he’s doing. To be honest, I’m not sure he’s asking me to lead anything, I think he intends on leading whatever it is he's coming with. Maybe he just wants me to go fishing (figuratively or literally) and when he tells me to let out the nets, to let out the nets. When he tells me to teach, maybe I should teach. When he tells me to pray, I should pray. If you talk to any fishermen he will tell you he knows the best bait, the best fly, the best technique… it’s hilarious (I do it too, we're all experts) but this is what I’ve learned about fishing: If there are fish and the fish are hungry, they will take the bait if it is real, or even closely resembles the real thing. I was looking around for a picture (to use for a kids handout thing at church) and your blog came up. So I read it. And as a youth pastor, I feel the very same ways. I definitely don't "have it figured out", but I feel that the more I invest in discipling particular youth the more effective at this whole thing I am. I have a wonderful wife Gemma, the most beautiful little girl, Isla Grace and baby boy, Levi Hunter. I am a Youth Pastor at Grace Fellowship Church. I've been singing and writing and playing guitar since I was 15, I want to write a book. I am trying to chase after Jesus the best way I know how.